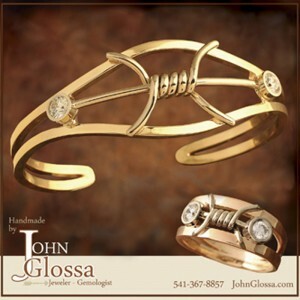 14 Karat yellow and white gold Barbed Wire Bracelet. This bracelet features a 1/2 carat diamond set on each side of the centered white gold “barbed wire” design. This bracelet has been a “flag ship” work of my art for ten+ years now. My friend Sarah prefers it be titled: ‘intertwined’. It is a bold design, yet the openness keeps it from being overbearing. This bracelet can be fabricated to fit the wearers wrist ideally. 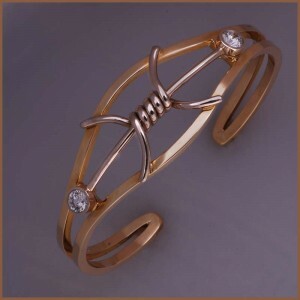 This stunning bracelet can also be made without gemstones/ diamonds. Diamond sizes available 1/10ct, 1/4ct, half carat stones and up to one full carat per side. “Thank you for your inquiry regarding the Barbed Wire Bracelet. To build a 14 karat two-tone bracelet is $2,800.00 for a size 7 inch wrist size-without stones. 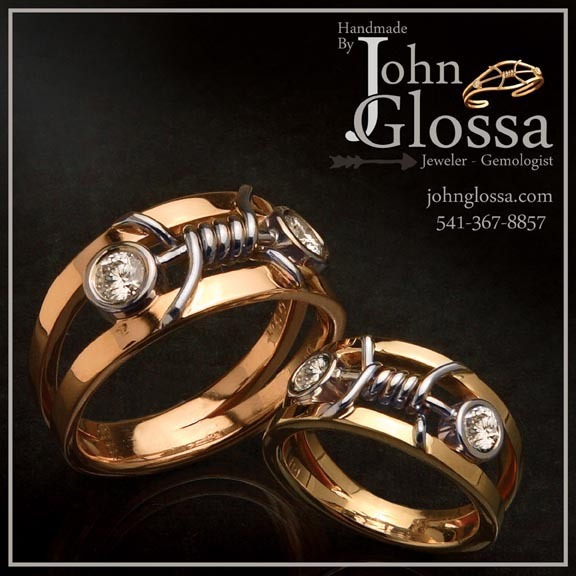 Adding diamonds to the design varies in price according to diamond size and quality. Why bother with dull stones? For premium grade one carat diamonds I would do an advanced search and pricing. With diamonds ranging in price in this days quote September 14, 2016: $3,500.00-$12,000.00 per pair in addition to the base price of $2,800.00. 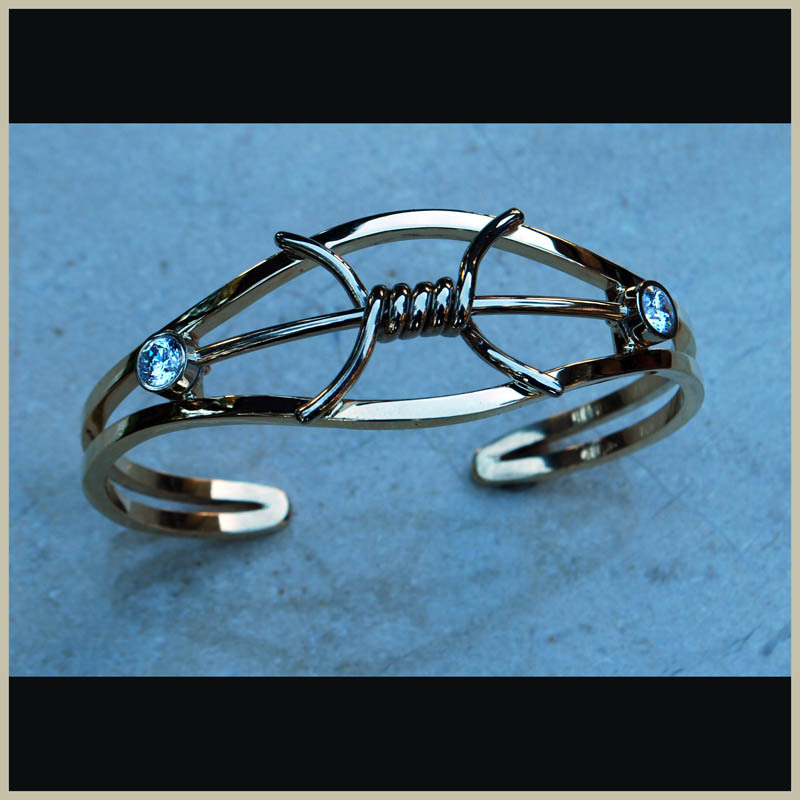 I can custom make wide 14 karat white gold bezels that actually make a stone appear larger. 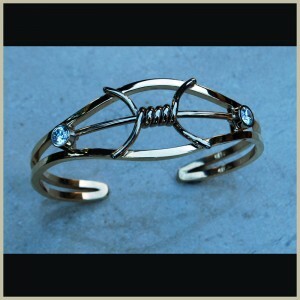 It would add about $150.00 to the base price of the bracelet.